The Red Cross has modified their program to distribute holiday cards to the military, veterans and their families a little bit. They are moving it to the local Red Cross offices. I feel it’s still an important program and will contact our local Red Cross office. For more information, please go to here. We ran across this idea last year, but it was already too late to get started for last Christmas, so we pledged to make this happen this year. The American Red Cross will deliver holiday greetings to military members, providing a “touch of home” for our troops during the holiday season. The deadline to have the cards at the American Red Cross is December 6th. Use generic salutations such as “Dear Service Member.” Cards addressed to specific individuals can not be delivered through this program. Only cards are being accepted. Do not send or include letters. Do not include email or home addresses on the cards: the program is not meant to foster pen pal relationships. Do not include inserts of any kind, including photos: these items will be removed during the reviewing process. Please refrain from choosing cards with glitter or using loose glitter as it can aggravate health issues of ill and injured warriors. If you are mailing a large quantity of cards, please bundle them and place them in large mailing envelopes or flat rate postal shipping boxes. Each card does not need its own envelope, as envelopes will be removed from all cards before distribution. To learn more about this wonderful program, please visit American Red Cross (link). 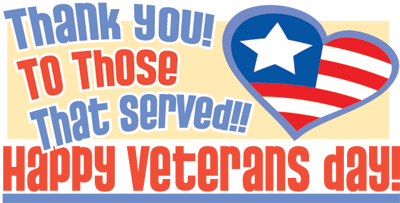 We hope that you will be inspired on this lovely Veteran’s Day and make a difference by sending holiday wishes to the brave souls who protect our rights!